Thanh Khuc (or Tranh Khuc) Village at Duyen Ha Commune, Thanh Tri District, Hanoi is famous for making their traditional Chung cake. This is a place where the spirit of Tet comes alive the earliest in Hanoi. Tranh Khuc Village is particularly busy at the end of the year. 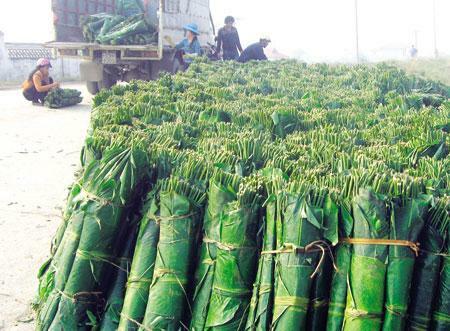 Although Tet is approaching next month, the entire village is preparing to make Chung cake. You cannot find such a traditional feature of Tet anywhere other than here. Chung cake is a traditional Vietnamese cake which is made from glutinous rice, mung bean, pork and other ingredients. Its origin is told by the legend of Lang Lieu, a prince of the sixth Hung King, who became Hung King 's successor thank to his creation of Chung cake and Giay cake, which symbolised respectively the Earth and the Sky. Considered an essential element of the family altar on the occasion of Tet. 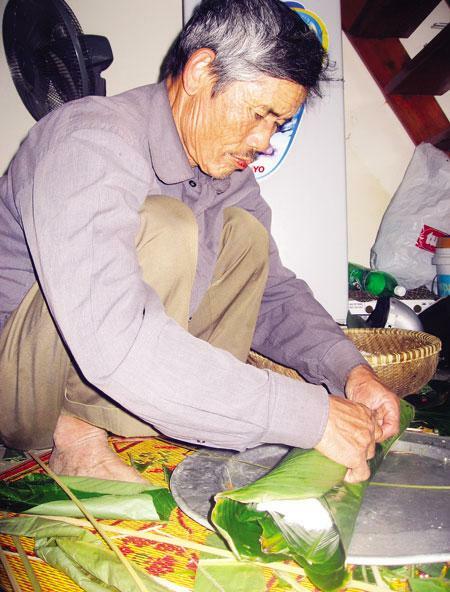 The making and eating Chung cake during this time is a well-preserved tradition of Vietnamese people, and the specialty of Tranh Khuc Village. “Daily, we wash la dong (a special kind of leave which is popular only in southern Asia), rice, beans and then wrap chung cake. We cook it for a night and the next day we will sell it. We keep working day and night,” said Nguyen Thi Thuy, a villager. Each family here has 10-25 workers with 5-10 big pots to cook chung cake. Their business used to be retail sales but now it has grown to wholesale. Making Chung cake is a traditional business in this farming village and has remained very successful. It helps them to improve their livelihood. Ngan’s family is among those becoming wealthier thanks to making chung cake. “My family’s economic situation has been much improved thanks the Chung cake business. We just inherited a legacy left by our ancestor and continued to develop it,” said Ngan. However, the title of “Chung cake Master” belongs to Nguyen Minh Tan, who is over 50 years old but has spent 30 years making chung cake. He has about 20 employees working for him. His entire house is full of la dong, strings, and sticky rice. He has sold thousands of Chung cakes. The first time he exported Chung cakes was back in 1994. He exported 4,000 cakes to Germany in addition to Australia and Russia. “It looks simple because every family makes Chung cake on Tet holiday but when it becomes a business, it needs a lot of effort, experience and preparedness. We want to maintain our prestige and reputation for our off-spring,” said Nguyen Quoc Trieu, a villager. In order to make a good Chung cake, we need to buy and select high quality ingredients. 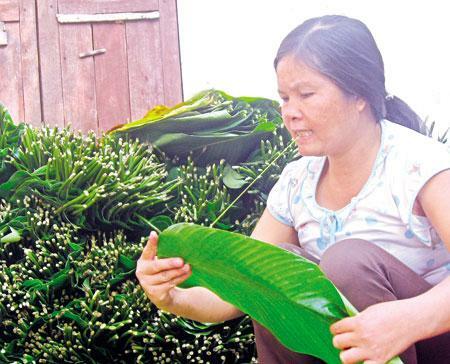 For example, la dong should be bought from Thanh Hoa, Nghe An or Yen Bai, Lao Cai and Ha Giang provinces because they are soft, hard to be broken and have a nice green colour after cooking. La dong and giang strings have to be washed carefully in order to preserve the taste of the cake. Giang strings may be soaked in salt water or steamed so that they can become flexible enough for wrapping. Fat and lean pork is prefered for Chung cake because its fatty flavour associates mixes well with the glutinous rice and bean, developing a special taste, according to Trieu. “We make Chung cake for the whole year. We can earn VND10,000-15,000 ($0.5-0.8) per cake. But during Tet, we can earn much more money,” added Trieu. The people here prepare for Tet beginning in early December and keep busy for the entire month. They welcome the New Year after the last cake has sold. Tranh Khuc Village has 90 percent of its population making Chung Cake. They have been famous for 40-50 years. They don’t even need mould to wrap Chung Cake in the right manner. Many masters can make hundreds of cakes of the same size.